Trafford Health Centre in Manchester has three GPs and 4,300 registered patients. Based in Trafford Hospital the practice has no space for expansion. To improve the physical working environment of the practice and release time as a result, it took up the Productive General Practice (PGP) Quick Start programme offer of support delivered by NHS England’s Sustainable Improvement team. The programme is part of the support available through the General Practice Forward View. Use the Well Organised Practice module from PGP Quick Start to improve the physical environment to help the practice team work more efficiently. An improvement team comprising of the practice manager, reception and admin staff, practice nurse and health care assistant was formed to work through the module. The work started with a walk-through the practice, where the team identified potential areas where valuable staff time is wasted. This helped to identify the following issues that were having an impact on how efficiently the practice team worked. Areas were overcrowded and cluttered e.g. reception, practice manager’s office, business manager’s office and the stock room. Overstocking was taking up scarce space e.g. dressings, nappies, oxygen masks, as well as paperwork which needed reviewing and/or archiving. Clinicians were struggling to locate items in stock cupboards and even their own clinical rooms. Admin staff were reporting multiple interruptions daily (up to eight hours of staff time) to help clinicians find things. The team used the findings of the walk-through to identify the administrative and clinical areas that could be reorganised. The team used the 5S model which helps introduce the concept of standardisation in a practice, it gives a systematic review of how space is used, helping to create a workplace that is easy to use, safe and clean. 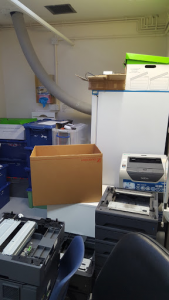 Initially the administrative and management areas underwent 5S, resulting in a highly impactful decluttering and reorganisation operation. ‘Before’ and ‘after’ pictures of the initial administrative and management areas that were 5S’d first. 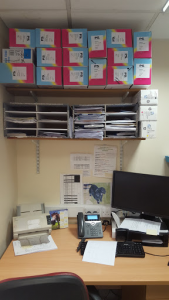 Once the impact of the physical changes was recognised other staff saw the benefits and followed suit, undertaking 5S in their own working areas e.g. reception, scanning room, store cupboards and waiting room. After meeting with the nursing team, minimum levels of clinical stock were agreed and the practice team is now more robust with ordering. The ordering process itself has been streamlined with ordering now only taking place on a specific day of the week. A practice wide database is also in development which will enable stock levels to be tracked and help identify areas that require review. 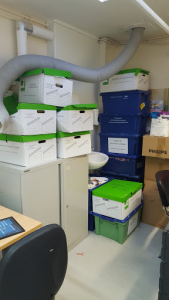 Stock rooms and clinical rooms have been decluttered, reorganised and fully labelled. The impact of this has been significant as clinicians no longer need to waste time searching for items and/or interrupt admin staff for help. Collectively this has released over 40 hours* a week of the practice team’s time. 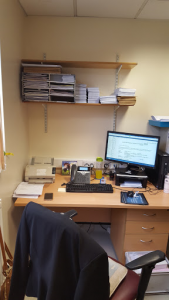 As a result of the time saved, GPs are now able to have a dedicated desk space where they can do their admin work, as well as being able to hold weekly briefings with one another. The admin team feel more empowered to suggest or trial a change within their working environment and have less call for sourcing stock for clinicians meaning the admin work i.e. tasks and Docman have more time spent on them. The practice feels calmer and more organised with no last minute panic to find items or equipment. Patient feedback has been positive. The waiting room has vastly improved and patients now find it much easier to find information. The team has learned how to apply the 5S technique, helping them to maintain the improvements. * Time based on a total of 7.5 hours released for 3 GPs and 35 hours per week for 22of the admin team including managers, secretaries and receptionists. Make staff aware that this is not a reflection on their personal tidiness; it is about encouraging an efficient and more comfortable working environment, which is everyone’s responsibility. Remember that a new ‘home’ for something is not always set in stone, some changes may not work so there may be some items/equipment you may need to move back.